The new device is smaller than an AA battery yet holds up to 1,000 songs, Apple said. The pre-shrunk Shuffle also adds a new VoiceOver feature that can recite song titles, artists and playlist names, as well as provide status information, such as battery life. Apple said the gadget's battery life clocks in at 10 hours. Priced at AU$129, it comes in silver or black. 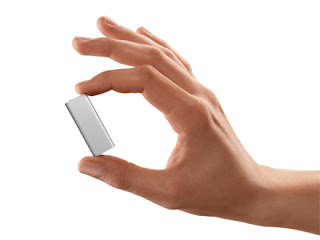 The aluminium body of the third-generation Shuffle stands 45.2mm tall and is 7.8mm thick. The navigation and volume controls are in a small protrusion on the right earphone cord. With the new Shuffle, users can organise songs by multiple playlists. The VoiceOver feature can speak in 14 languages: English, Czech, Dutch, French, German, Greek, Italian, Japanese, Mandarin Chinese, Polish, Portuguese, Spanish, Swedish and Turkish. VoiceOver is Apple's term for the text-to-speech engine built into Mac OS X Leopard in order to let blind people use a Mac more easily. The "Alex" voice generated by that software is the one that Leopard users will hear, while Windows users and Mac OS X Tiger (10.4) users will hear a different voice, said Greg Joswiak, Apple's vice president of iPod and iPhone marketing. The first time you sync one of the new iPod Shuffles with iTunes, Apple will install software on your Mac or PC that makes the voice feature possible. This isn't speech recognition; you can't speak into your iPod headphone and order up Bob Dylan's Blood on the Tracks, but the voice feature is more useful than just reminding you of the name of that song you downloaded three years ago but had forgotten about until it randomly came up on your Shuffle. Apple now supports playlist discovery with the new iPod Shuffle. A button in the centre of the headphone controls, when held down for a few seconds, takes you into a playlist mode where the speech engine recites the names of your playlists in alphabetical order, allowing you to select a playlist by pushing the button again, Joswiak said. The only controls on the device itself are the on/off switch and the shuffle/linear switch, Joswiak said. Apple will ship its own in-ear headphones with the Shuffle, but third-parties will be able to make their own headphones that have the controls, and they'll also make adapters that will let you use the controls with existing headphones, he said. Apple is discontinuing its 2GB Shuffle introduced at last year's iPod event, but will continue to sell the older AU$65 1GB Shuffle, Joswiak said.